Discussion in 'RGB Lights - Intelligent Pixels and 3-Channel RGB' started by thevikester, Jan 20, 2013. I've been reading until I can't think straight, so just need a little direction. I am using a sandevice E682 and 16 smart string 2811 with 4 wires, of which its the positive, the data, and 2 are ground wires. I have some 3 wire Ray Wu pigtails that if I understand correctly, I want to wire one end of the pigtail to the controller and have the other connected to my SS, for ease of unplugging and moving controller and strings. By using a wiki page, I was able to figure out what color of wire from the pigtail matched up with the smartstring, so now that I clarified everything in my mind, 2 questions, the pigtail that attaches to my controller, do I want to be connecting the male pigtail to the controller, or female, or does it matter as long as I stay uniform? 2nd, what should I be doing with the 2nd ground wire on the smart string? Its currently part of a water proof connection with the data wire. Cut off the waterproof connecter and just not use the ground, or hook both grounds from the smart string to the ground on the pigtail? Hope this makes sense and I appreciate any direction, and if I am off base altogether, its okay to slap me down, this is my first go around with RGB. Vikester, I was in the same boat as you once. Read to much that it made my brain hurt! It doesn't matter which end of the pigtail you use on the controller. It can be either male or female and it doesn't even have to be uniform! The 2nd black ground is for injecting power. If you're simply transferring ground from one 2811 strip to the next, then you'd just use one ground but if you'd use that 2nd ground if you were injecting power between those strips. Do you have a power supply picked out? You're going to need to inject power in between most likely each strip. I have three 2811 strips and was told by the "professionals" here that I needed power injected between each strip. 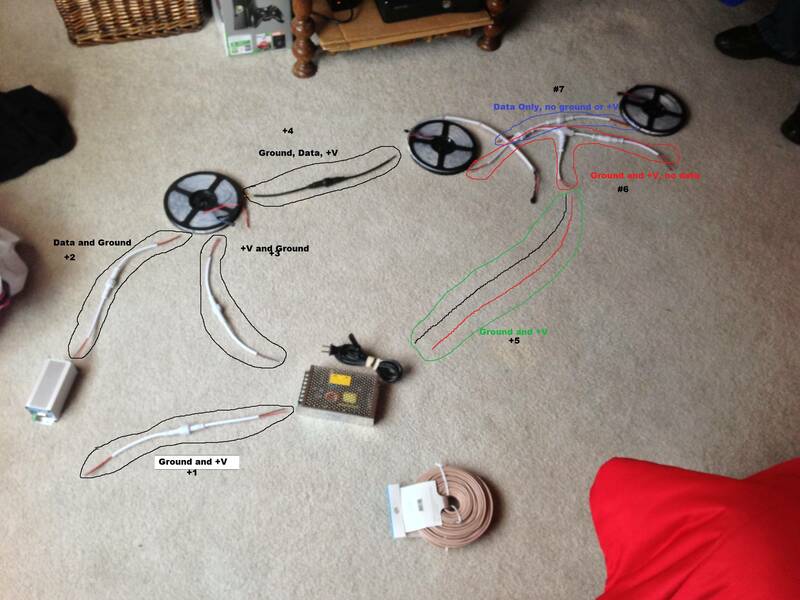 Below is a picture of what my setup looks like but not soldered, wired, etc. Ignore the + and # symbols. Always put the female connectors on the source (controller or power supply output) and the male connectors on the destination (lights). Electrically it doesn't matter, but it's the sane choice and will help protect against accidental shorts. As for the two ground wires on the strips / strings, use one or both as dictated by convenience. So what am I doing with the wires coming out the other end of my smart string>>> I have no intention of connecting one string to the next, it will be one string for each pigtail. Thx for the help guys. If you not going to connect strings together, you would just seal up that end and make it as waterproof as possible. Ok, I think I've got the wiring aspect down. No clock wire on smart strip so disregard with my pigtails, no need for additional power injections based off the length of my strings, wrap up and water proof the end of the string that has Data Out since I won't be using them for this prop. With the additional ground wire on my smart string, I can either combine it with the other ground OR also wrap and waterproof it. Does that sum it up pretty well, or did I miss something?? ...just need to get some 3 wire extension for the pigtails to come out the bottom of my controller box as the ones from Ray are short. Ray can supply those pigtails with longer cable. Just make sure you get the exact same type for all of them as there are a few different (but incompatible) versions out there. i've got 1 100 matched sets, I just need to splice in some extension wire. Is there something i need to be careful with that?? Oh, didn't read that you already had the short ones. You can join extra wire onto those for sure. hey eddy! Actually the ones that he sent are just not long enough to connect to the controller and actually make it out the bottom of my box...but I see where those extensions could come in really handy!